Earworm populations (known as bollworm in cotton) were relatively low in our system from 2011 to 2016. Arguably, at least a small part of this has to be due to widespread plantings of corn hybrids with the VT Double/Triple PRO traits, Optimum Intrasect, and adoption of the newer Agrisure Viptera and Intrasect Leptra traits. However, earworms are now resistant to the Bt toxins present in corn hybrids without Vip3Aa20. That means that earworms will only be controlled with Agrisure Viptera, Intrasect Leptra and Trecepta traits that express Vip3Aa20 toxins. Although light and pheromone trap captures have been extremely low- maybe due to some extended cold snaps this winter (soil must reach -3 degrees F to kill 50% of overwintering earworm pupae)- earworms are breaking through a lot of Bt corn this year across the state. This means that, although populations have been low up to now, they are building up the corn generation and surviving very well. Also, their offspring are primed to survive on soybean and Bt cotton. 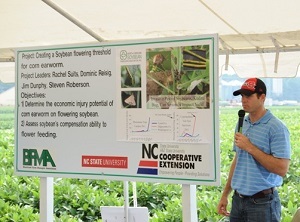 The good news is that corn earworm has been demonstrated time and time again through replicated and published university Extension research to not impact yield in timely planted corn. These results are consistent across the southern US (Reay-Jones and Reisig 2015, Reay-Jones et al. 2016, Bibb et al. 2018). There is evidence that the corn plant can compensate for earworm loss by increasing undamaged kernel weight lower down the cob (Steckel and Stewart 2015). Yield loss can occur when earworm is present in the ear with fall armyworm. However, this occurs more often in late-planted situations and is rare in North Carolina. Finally, although earworm feeding can be associated with aflatoxin contamination, environmental factors other than earworm are much bigger drivers of aflatoxin levels. 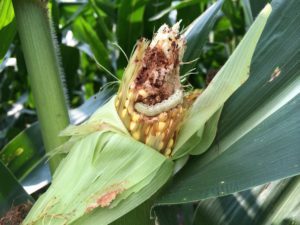 The bad news is that the offspring of earworms that develop and survive from Bt corn will survive better on Bt cotton than if they had developed on non-Bt corn. This means that many of the earworms coming off corn now will present a problem for Bt cotton later in the season (see this article for 2017 cotton recommendations). Therefore, corn growers should be ready to treat this insect in soybean and Bt cotton.